Here’s a writing activity that I made years ago, but still going strong! Set up the game by matching the letters with the correct colour picture. 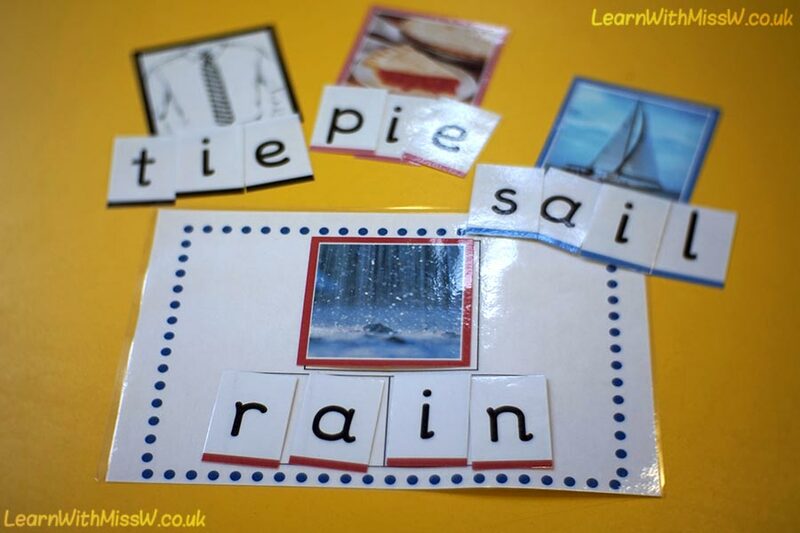 Put the picture on the word mat and then the children use the letters to spell the correct word. This set is for the Jolly Phonics ‘ai’ and ‘ie’ sounds. I also have CVC, 4 sounds and other digraph sets made up. I usually use this as an adult supported small group activity (partially just to help manage all the pieces of the game). Because of the support provided by giving the children the letters they need, they are often able to correctly write longer words then during completely independent writing. make sure you don’t lose any pieces!